A little about me, my music, and my favorite lesser known music apps. Ive been so caught up with just writing reviews, that I have neglected the main purpose of my blog, the experiences of making electronic music. Yes reviews are a part of this, but I didn’t intend for that to dominate. That said, I wanted to take a moment to write a bit about my music, and my favorite lesser known apps I think also deserve better recognition. Since I started composing music on iOS, way before the iPad was around, I used only my iPod touch. I was picked up unexpectedly by an indie music label run by a friend, and very respected electronic music artist, Dean DeBenedictis (AKA Surface 10) of Fateless Music. At that time very few people were taking music made on those early devices seriously. He recognized my unique bond and commitment to what was at the time new technology. I didn’t even realize it, but learned that I was pretty much alone pioneering what Dean called “serious music on an iPod and nothing else.” Was I THE first? Probably not, but I definitely was one the the very first few to take it seriously, and not even use any computer aid, no midi. Now having experienced the iPad, it’s hard to go back. I still use my iPod Touch for some things. Just not as much as back then. I’ve seen and used so many music apps I feel very comfortable with talking about them. I believe I have a solid handle on what’s great, average, or poor regarding iOS music. I own a lot of high profile music apps that are staples in my work flow. They have already had loads of attention, and for good reason. I also have many that are not as well known, but relatively speaking, are just as good. Here are a few of my favorite lesser known music apps! For an ambient electronic music artist like me, this synth is very nice. It’s a formant synthesizer with virtual analog, and vocoder sounds. There are many preset sounds to use, and many do sound similar with only subtle variations, but Synthtronicas real strength is it’s ability to bring in sounds made in other apps to create new formants. I also can record anything through my iPad mic, or iRig to create some really unique sounds. It has this dynamic multi touch filter with 11 independent filters to control by touch. Depending on how I slide one, two, three or even more fingers around the filters play surface the effects can be subtle to very dramatic. Of course while doing this, recording the performance is an option. I used this synth a lot in my song “A Matter Of Rain”. It’s a fantastically expressible synth. Sounds made can have a big personal touch. This really deserves a lot more respect. It’s a full featured semi modular synthesizer using both subtractive, and frequency modulation synthesis. It has 90 controllable parameters of modulation, multiple envelope stages. It has wave sequencing, and granular synthesis, a crazy amount of options to tweak, stages of FX, LFOs, A band splitter for FX Processing by frequency band. I could go on and on and on, Cyrstal is a synth tweakers dream! This is the synth I go to for making lush, evolving sounds unlike anything else. Don’t let the strange playing surface sway you, it really works nicely. This is another somewhat lesser known music app that I use often. It’s a 12 track, generative music lab, with live FX. The 12 tracks are uniquely laid out like cells where you mix your music. It’s quite capable of standing alone as a full audio workshop. However I use it for other purposes, FX. The FX suites in Mixtikl are amazing. This is where I take files in need of that certain something, that I don’t always have available in some apps. It has Chorus, Reverb, Distortion, Filter, Overdrive, Delay, EQ, and compressor. 4 tone generators, and 3 FX control units. You can chain up to 4 FX. The order of the FX in the chain have a huge impact on the sound. I might not like Reverb, Delay, EQ and reverse the order of the chain, and a whole other dimension opens up. Not only do the FX have several presets to use for quicker application, but you are free to adjust each by the various knobs. Best of all, record the new sound with these FX added, copy, and paste with them all intact to where ever you wish. In my case MT DAW. I should mention as well, that Mixtikl has a huge library (380+) of included Generative Parts of many different styles, and lots of ambient electronic parts to use. They don’t sound like clips you’ve heard to death already, and you can always cut them up, or edit them elsewhere making them your own. It’s up to you. So in the interest of not going overboard I’ll stop with these top 3 of my favorite lesser known music apps. These are not mini reviews, these are my opinions based on my needs and how I use them in my music. I feel strongly about the quality, usefulness, and creative design of these superb music apps. I can’t do without them, and I hope more people will take another look at each. 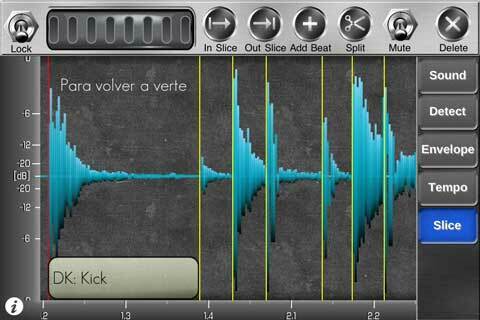 Reforge by Audioforge Labs Inc is described as the “Swiss army knife for audio files on iPad”. It really is. I find that Reforge has been nothing short of necessary for use in my music work when I need to do wave form editing. Everything is simple to use, or apply via the intuitive use of the touch interface. Reforge does what it’s supposed to do without clutter. Trimming, cutting, slicing, cropping, copy paste within the file or even paste in from another file. It’s all here, just about everything needed to make audio wave form edits, and almost effortlessly. The included FX that can be automated are, volume, stereo balance, stereo widening, low pass and high pass filters. Pitch and time shift are available but not automated. These features can all be used with the control markers to automate effect levels and at multiple positions, by just touching the screen at the desired place to apply the effect. When called for (such as cropping) touch and hold about half a second at the start point and drag to the end point area of the wave form to perform the edit. Adding multiple effect points (markers) by double tapping in the spot you wish to add to. I’m not going to write an instruction manual, this is to illustrate just how easy it is to get the job done, and there is a lot of room to be creative. Check Out http://www.reforge.info/Site/Reforge.html for detailed specs or developer info. In portrait mode there is a very handy help screen to explain each function in detail. Just touch each button you want info on and it appears at the top of the screen. Nice touch. Landscape provides a larger view area to do your work. 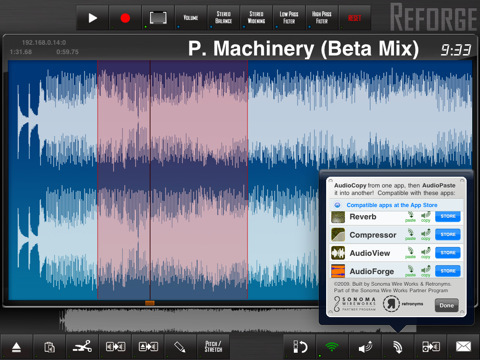 Reforge supports several file sharing options such as, import from mp3, im4, aif, from email directly into Reforge. Audio Copy Paste between compatible apps with a 12 file history. iTunes file sharing to upload your files including .wav. The good old wifi to transfer files as well. Moving files can’t get any easier. Besides cutting & cropping etc, I have found I use this a lot for adding stereo depth to otherwise flat audio files. However I must point out that I’ve also experienced more than a few crashes especially when applying several features in one file. I have also heard artifacts (clicks or pops) during the work process, but they don’t usually make it into the actual saved file. These two problems obviously can be a nuisance, as it’s tough to be certain when a click was properly removed until I double check it pasted elsewhere and give it a listen. Crashing, well no one needs that explained as to why it’s a problem. I’m not going to suggest these are deal breakers though, and Audioforge Labs works hard to improve his apps. More often then not, I am able to complete my work in Reforge no problem. Updates are being worked on to correct these issues, and improve the app, including future universal app support. Reforge gets a solid 4 stars. Great tool to have in any iOS musicians collection. 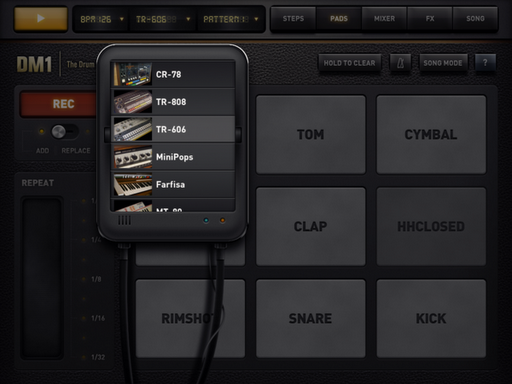 DM1 The Drum Machine App Review: ParadiddelyDANG! Review based on use with iPad 1. Fingerlabs confirmed that audio copy paste functionality is NOT coming soon. I asked via email last month after the expected update they mentioned of “early September” in the comments of this very review, came and went, with no new date or time frame for ACP given. Well. Disappointing. I’ve said it countless times, a mobile music app without ACP is as useful as a car without a steering wheel. If I’m out at a park, or where ever, how am I supposed to use this? I can’t. No one can, unless hooked up to some other hardware to record with. Forget that, iOS music is about mobility and freedom not wires and restrictions. DM1 gets a star back at 4 since they at least added iTunes File sharing and full FX support for both iPads. I like the improvements and DM1 is excellent, but I don’t like having to wait this long for ACP. Well, I’ve seen a lot of drum machines, but this is pretty nice. DM1 is designed for fun, ease of use, and for the professional. Usually apps with that claim don’t deliver very well, but I gotta hand it to the guys at Fingerlabs, this really is all that. It has the best graphic design (from my eyes) and a clear style inspired by vintage machines. This is a look I find quite appealing. I cant explain it, but I just love looking at the various screens. It is functional and artistic. Not to mention pleasant. 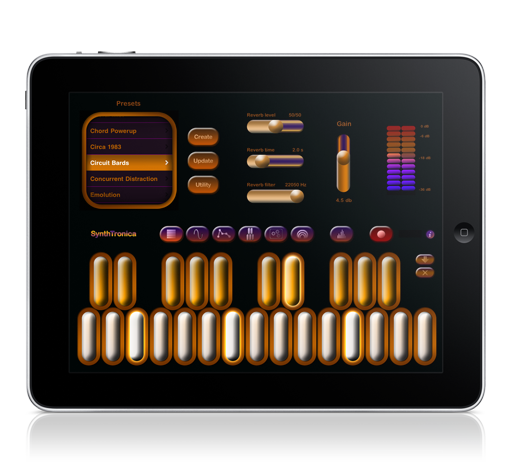 It has a multi touch step sequencer that is very responsive, and intuitive. A Mixer section to make adjustments to volume, pitch, sample length, mute, solo and custom drum kit element for each channel. Oops, no pan? FX track pads section for adding some real time FX like overdrive, and delay…more under development. Also if you have an iPad 2 there are Phaser, Texturizer, and Robotizer. The last section is the Song Composer. A drag and drop system for placing beat patterns you make easily into the timeline. Quite simple. The interface, lay out, functions are just superb across all sections. This is a fluid design many developers could learn from. 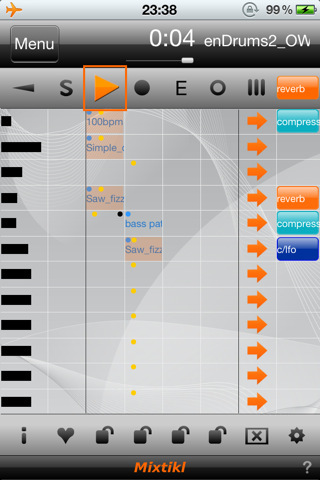 DM1 has some of the highest quality sound design I have heard in any iOS Drum Machine. The included drum kits in DM1 sound great! Various vintage and production kits that vary in some cases drastically from one to the other. My personal favorites are The TR 909, Melodic, and Glitch. They all (34 since last updated) are faithfully recreated and mastered. You can see a lot of love went in to creating DM1. 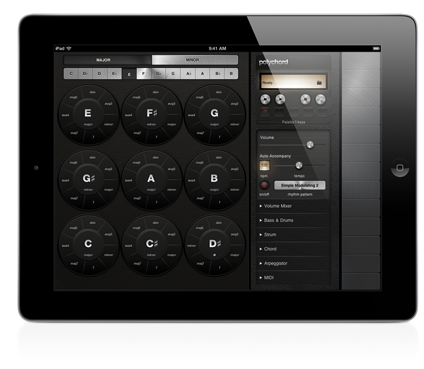 You can feel just how serious Fingerlabs is about delivering the best drum machine possible to iOS. It is quite a marvel, and joy to see and hear. All these goodies, and there’s more to come. I asked Fingerlabs about the FX limitations specific to the iPad 1 (which is what I currently use) and was assured that more FX for both iPads are in development. Maybe Pan will be added as well? I really really want to start using DM1, but can’t because there currently are zero sharing capabilities, not even midi yet, but I don’t care since I don’t use midi at all. However they are in development, I’m just not very patient. I hope it won’t be long before we see DM1 mature into a fully functioning drum machine to include in our music. Once Fingerlabs does add all these things I mentioned above, DM1 will be a big time contender, and for me a new favorite go to app for my drumming needs. For now, it’s just really cool leaving me drooling for more. 4 Stars yearning for 5. I couldn’t have said any better, but what does that mean? It means that you can take bits of various samples from your own voice or surroundings, recorded with an internal or external mic, mix them up with a number of samples, beats, or patterns. Slice n’ dice and create some pretty wild stuff of your own. If you can think it, Beat Twirl can probably do it. You only need to put it all together. With the tools in Beat Twirl, putting your work of art together is not very difficult at all. Audio quality? Good. User interface? OK. I’m finding some things in the UI are a little counter intuitive. Where I might expect to just touch a part and make something happen there is actually a button for that. It’s not an obstacle at all, and a pretty minor concern. All the controls and tools are there, it just take a small amount of getting used to it. Once you do, you can have a ball, and make some interesting things. I have experienced some crashing. I asked Tiv Studio about this, and received a concerned, and very helpful response. Customer Service rates high! I won’t get all into the emails about the crashing, but they are aware of it, and working on it. Some crashes may also have something to do with my iPads recently updated iOS version? Depending on your version, it could be worse? So it seems fair to give them a little time to breathe and work out some of these kinks. A cautious but promising 4 stars, only hesitant because of the instability. Updated 8-26-11 Polychord (V2.66)keeps getting better, and this latest update is really cool allowing Polychord to be used as a MIDI controller with more apps and devices then before. It now sends MIDI out through all available ports. 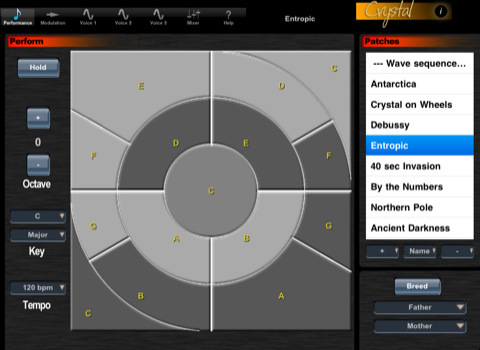 Now with virtual MIDI controls to run other compatible synthesizers in the background on your iPad while multitasking! Also MIDI clock/sync allows you to control compatible beat based music apps. That’s pretty cool, stuff and I don’t really use MIDI. Though, I am looking at MIDI with very curious eyes, as developers are really coming up with some amazing new ideas. I can’t wait for ACP. Polychord is a unique instrument that can be used in a pro studio environment or alone as a nice simple way for anyone to explore the creation of music. The first thing that impressed me was the layout and design. The chill feeling is promoted (for me anyway) in the dark yet realistic design. It is as soothing as the sounds Polychord produces. It just looks real. Nothing busy or flashy, and I love that!It also looks really interesting with the chord circles having the different types of chords wrapped around them. This makes chord changes incredibly, intuitive, easy and fun. A very nice idea to inspire chord variety, and exploration. Polychord can be a bit of a portable band with auto accompany, arpeggiator, and their various functions. Nice for a relaxing little mini band in your lap to express ones self or explore and find inspiration. The audio quality is good, nice and clean, though the preset sounds are limited, and sound a bit cheesy to me. Reminds me a little of the presets from those older Casio keyboards from my childhood. Remember though this has midi, so you are only limited to these presets if you don’t wish to explore that midi capability further for far more exciting and powerful sounds. You play it by picking or strumming a ribbon like keyboard on the right side. You don’t have a lot of keys there, but that’s for good reason. Only the keys that are in the scale you choose are necessary, which makes great sense and fosters an uncluttered play surface. Clearly a lot of thought went into making this a simple, straight forward instrument that wont allow you to make many mistakes. Even unintended key strikes work out, since everything is always in tune. My only gripe is that I cannot copy paste anything I make using Polychord into other apps. This strikes me as a little odd since it is intended to be easy and fun to use. Its not fun for me as one who uses ONLY my iPad to create, compose, arrange and mix all of my music. This is however not a major problem for most users, considering the intent of Polychord is more geared toward those using midi. While I personally cant really do much beyond just playing with it, the full midi support for controlling DAWs like Abelton or ProTools makes it very accessible and far more capable. Midi also makes Polychord a serious instrument with enormous possibilities. Its just not suited to those like me who have left external hardware and computers in the past. Then again, I may need to reconsider this in the near future.